HubSpot continues to build out its offerings. In a clear attempt to become the “One Stop Shop” for combined marketing and sales information automation for small and medium sized businesses, they’ve done it again and added sales tools to their marketing automation suite. 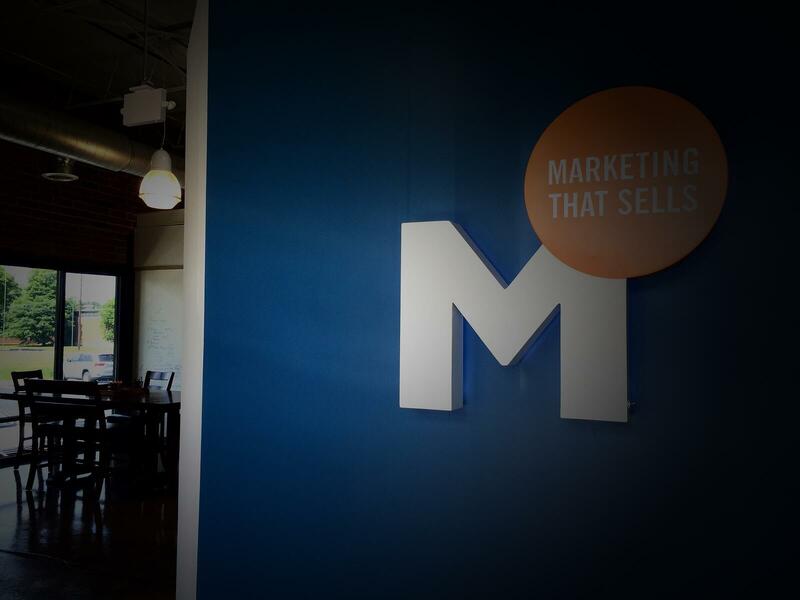 As a Gold HubSpot Partner, Marsden & Associates was one of the few to receive an exclusive sneak peek at HubSpot’s new sales products: HubSpot CRM and Sidekick. To help customers better integrate marketing and sales activities and insights, HubSpot’s new integrated sales tools focus on assisting sales reps to sell faster and more effectively with enriched prospect and customer insight. “At HubSpot, we’re laser-focused on matching how we sell to the way people buy today”, said Brian Halligan, CEO and Founder of HubSpot. After conquering the marketing automation field with integrated tools for small to medium businesses, HubSpot turned their sights toward the next big hurdle – bringing sales and marketing together in the process. According to a recent Forrester study, buyers believe sales reps struggle with being prepared with sufficient knowledge about their company, industry, and business challenges. 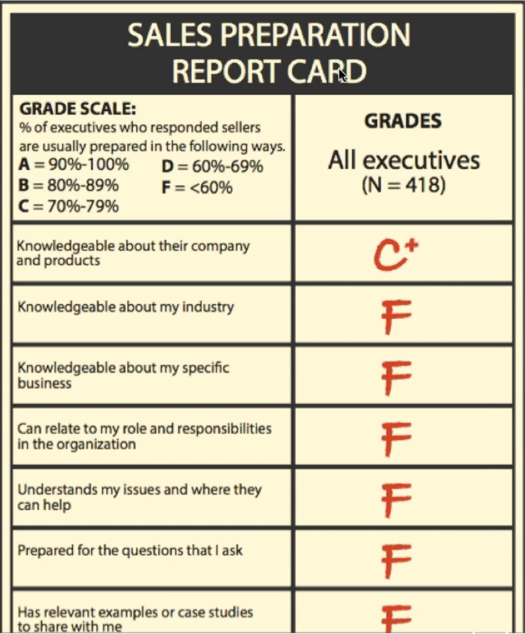 So how could Hubspot help Sales (and Marketing) be better prepared, informed and armed to meet the need of their prospects? Here we’ll give you a first-hand look at what these tools are and why they may be right for your Sales and Marketing organizations. The HubSpot Customer Relationship Management software (CRM) is designed for organizations that “get” the value of marketing automation, and know they need better sales activity integration, but have not yet fully embraced a CRM system to manage their customers, leads, and deals. 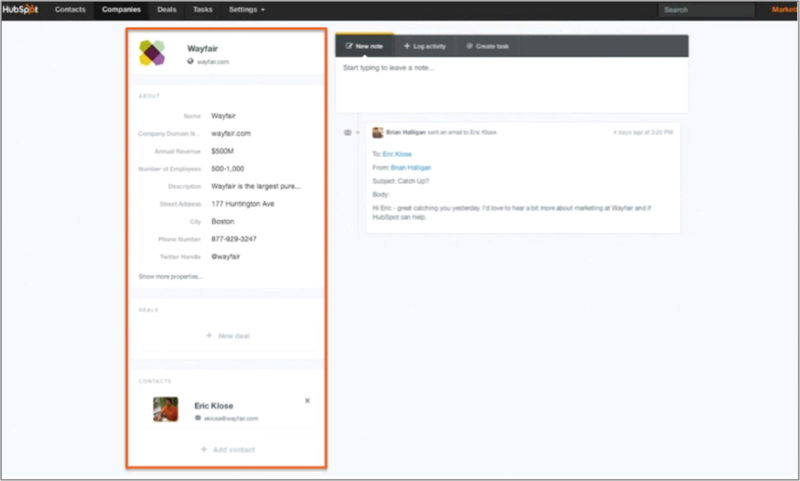 HubSpot’s CRM is an in-app toolset that is built right into the HubSpot portal navigation. But let’s get to the good stuff: what the heck can it do for me? Like most CRMs, it offers management of all your customers and leads, as well as tracks the status of your deals. But the key advantage with this tool is that it’s completely integrated and interconnected to the HubSpot contact database. This means that the contacts in the HubSpot CRM are the same contacts as the ones in your HubSpot marketing database. This will serve as a key differentiator to other CRM tools. 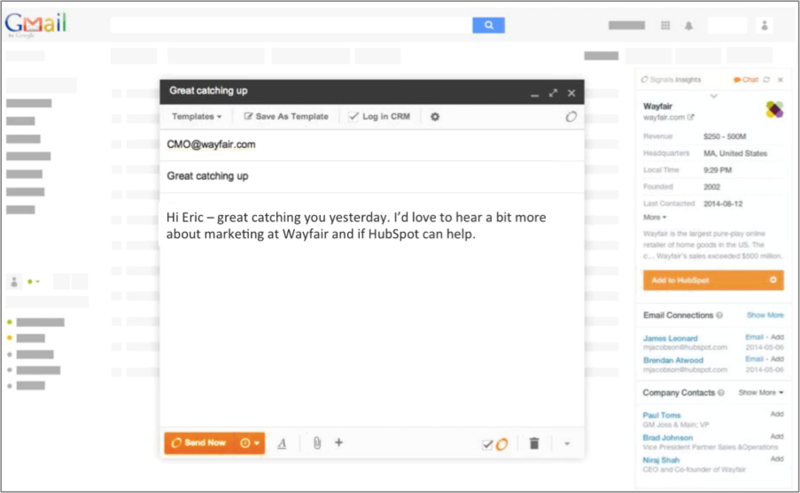 HubSpot will not only capture your prospect’s digital footprint, but it will now integrate that information directly into the CRM. This will supply your sales rep with the knowledge they need on what the prospect is searching for and downloading. HubSpot’s CRM goes the extra mile to pull specific data on each company into your database using third parties and online resources. In addition to a synced contact database and enriched company information at hand, the HubSpot CRM will also log any activity between the sales rep and a contact. The CRM allows you to engage directly with the contact - within the system - while keeping your communications organized chronologically. The concept of HubSpot’s all-in-one software is taken to a new level by offering tools to make day-to-day tasks and key responsibilities of both sales and marketing departments more efficient in a single platform. Sales reps can easily manage their lead data and customer information while Marketing is equipped with insight on customer needs and behaviors to determine targeted marketing offers. It also helps facilitate better internal communication between departments. Sharing consistent customer and prospect data between departments encourages clear communication and stronger alignment between sales and marketing. 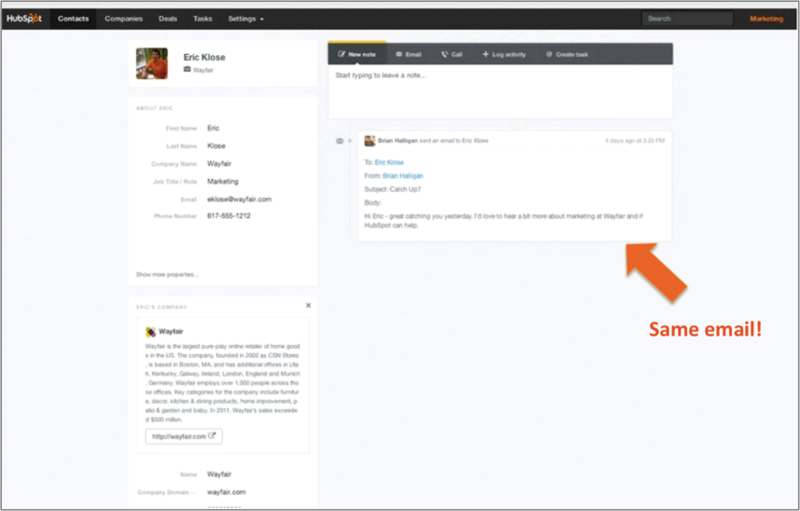 Sidekick is the new name for Signals, HubSpot’s email tracking tool. But make no mistake, they are not the same. Sidekick is a fully integrated system with the sole purpose of accelerating the sales process. True to its name, this tool functions as an assistant to the sales rep. – and rides on top of the CRM and marketing automation functions. Sidekick displays as a sidebar on your web browser, providing an array of information -- without needing to be logged into your HubSpot portal. So can Sidekick accelerate the sales process? In ways – yes. The greatest benefit that Sidekick provides to sales is the ability to have faster, more informed engagement with buyers. Even though each sales process is different, the time and distraction of keeping info in sync with the CRM can be enough to keep sales reps from effectively using the tools. This is where Sidekick shines by providing real-time updates to your communication history with prospects and quick access to company/contact information. For example, with Sidekick, a sales rep can draft an email to a prospect and have access to all their prospect history and information visible in the sidebar within the same browser page. Once the email is written, they have the option of saving a copy of the email to the HubSpot CRM. This can minimize manual touch points in updating a CRM, while also accelerating the communication cycle between salesperson and prospect. The element of time is something every sales person can appreciate. One day or one hour could make the difference in one new opportunity and a lost one. HubSpot and Sidekick are exciting new capabilities to improve sales productivity and bring intelligence and cohesion to the marketing and sales relationship. We look forward to using both on a more extensive basis, and to exploring the extent to which users can drive measureable increases in productivity and revenue with the first truly integrated, all-in-one marketing and sales management tool on the market.